You’ll find many free online maps for Algonquin Park on our maps page. Look for maps of Algonquin Park access points, best fall colour locations, hiking trails, canoe routes, day trips, mountain biking trails and cross country ski trails. There are a variety of maps and several excellent guidebooks available for the Algonquin Park area. Each map has certain advantages: for preliminary route planning and general information, we recommend the Algonquin Park Canoe Routes Map as a starting point, with the Backroad Mapbook map for additional detail. Once it comes time for detailed route plans and navigating on the trail, the best choice is the appropriate Adventure Map or Jeff’s Map for the specific area of the park you’ve chosen to travel in. Algonquin Outfitters stores carry maps and guidebooks from the suppliers described below. The Friends of Algonquin Park publish the colourful and informative Algonquin Park Canoe Routes map, with a scale of 1:126,720 (two miles to the inch). This map shows the entire park and is an excellent tool for basic route planning. Campsites, portages and canoe route possibilities throughout the park are shown. The back side of the map is full of important and useful park information. This map is printed on paper and is not waterproof. 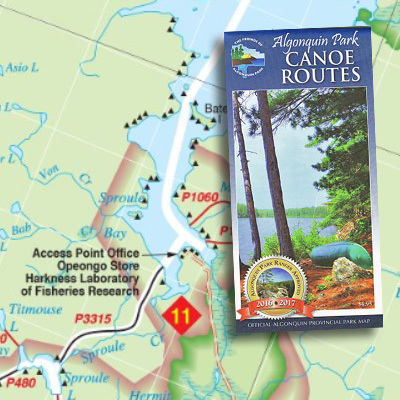 You can order the Algonquin Park Canoe Routes Map by visiting our online store. Jeff’s Maps are hand crafted by Jeffrey McMurtrie. With great attention to detail and background information, they have quickly become a popular choice among dedicated canoe trippers. Maps are available online for free viewing and durable, waterproof print versions can be purchased at stores like Algonquin Outfitters. Jeff’s Maps have expanded beyond Algonquin Park offering detailed maps of Temagami, Killarney, and even topographical maps from all across Ontario. Jeff even keeps copies of historic Algonquin Park maps and offers digital and printed copies of these historic maps. Be sure to visit his www.jeffsmap.com website or pick up a durable waterproof copy the next time you visit Algonquin Outfitters. Chrismar Mapping creates and publishes 1:80,000 scale Adventure Maps for Algonquin Park and other areas. We highly recommend these wonderfully detailed, waterproof maps for in-depth route planning and for navigational purposes on a canoe trip. Each map is GPS compatible, shows contours, navigational aids, campsites, portages, historic and geographic features and other useful information. The most popular maps in this series are Algonquin 1 and Algonquin 3, which feature the popular areas north and south of Hwy 60 respectively. Algonquin 2 shows the northwest corner of the park, including routes accessed from our Brent Store. Algonquin 4 shows the areas east of Cedar Lake and includes both the popular Petawawa River and Lavielle-Dickson routes. Algonquin 5 covers the area accessed through access point 17, Shall Lake. Daytripper maps for both Canoe Lake and Lake Opeongo are available, as are detailed maps of the scenic Achray/Barron Canyon area on the east side of the park and the popular Oxtongue River trip on the west side. Like the Canoe Routes Map, this waterproof planning map shows the entire park but offers the added detail of contour lines and colour relief shading. It is a richly detailed and visually stunning map and a great resource for general route planning. Along with campsites and portages, hiking trails, canoe routes and points of interest are marked. The scale is 1:125,000 and the map is GPS compatible. For more details on this map and the entire Backroad Mapbook series, visit backroadmapbooks.com. Saved from government extinction by public outcry, these maps offer extra geographic detail and are the traditional choice for many paddlers. Topographical maps do not show campsites, only a few portages are marked and the maps offer no background information. You can view and purchase 1:50,000 scale topographic maps online at Jeff’s Maps. It takes 17 of these maps to completely cover Algonquin Park! The Friends of Algonquin Park also publish an excellent and inexpensive map, with contours, for the Western Uplands, Highland and Eastern Pines backpacking trails in Algonquin Park. 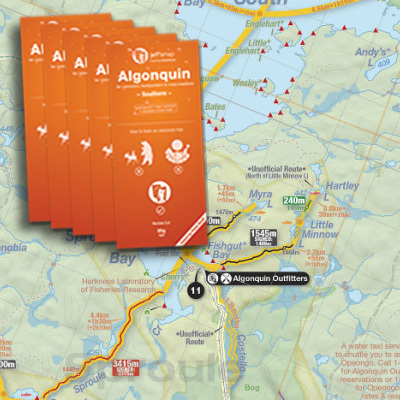 You can order the Backpacking Trails Map (along with guide books and many other useful park publications) online from the Algonquin Park Book Store. 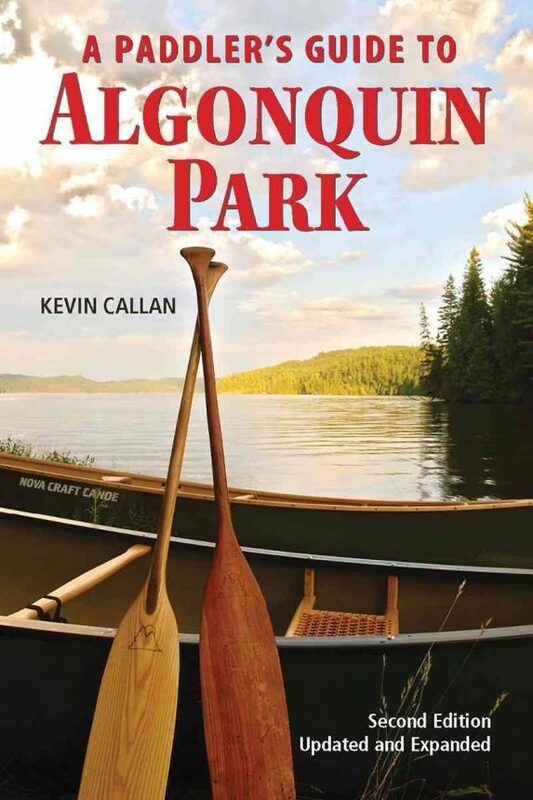 Kevin Callan’s book, A Paddler’s Guide to Algonquin Park (formerly titled Brook Trout and Blackflies), is an excellent resource for planning canoe routes. Kevin describes a number of routes, both popular and obscure, in an entertaining and informative style. The late Don Lloyd’s fine book, Canoeing Algonquin Park, is now out of print but remains a very useful resource for trip planning. We bought Don’s remaining copies and still have a good supply in stock (as of 2016). Different areas of the park are described and mapped so that you can put your own trip together. Don filled the book with interesting background information on the cultural and natural history of the park and charming illustrations. For whitewater paddlers, the Friends of Algonquin Park publish two detailed river guides by George Drought. One covers the Petawawa River, a stunning multi-day whitewater trip. The other features the Opeongo and Madawaska Rivers, which are generally run as day trips. All of these guide books can be ordered online from the Algonquin Park Book Store. Many of the maps and guide books described above can be ordered online from the mapmakers themselves, the Algonquin Park Book Store or from Algonquin Outfitters by mail order. Call Algonquin Outfitters in Oxtongue Lake to order Adventure Maps and Jeff’s Maps (1-800-469-4948). Postage is extra and there is a $5 handling charge for maps sent outside of Canada. The Algonquin Adventures website and discussion forum is a popular and useful source of information, trip ideas and second opinions. We consider Algonquin Adventures to be the most comprehensive unofficial Algonquin site. This active online community is sure to not only provide you with a wealth of first-hand, experience-based knowledge about Algonquin Park but you’ll find their users friendly and enthusiastic to share their experiences with you. Be sure to visit Algonquin Adventures. With a broader scope than “AA” above, this site has a variety of useful resources for canoe trippers and a very active set of discussion forums. Descriptions of many Algonquin Park canoe routes can also be found at the Canadian Canoe Routes Algonquin page. According to Google, “Google Earth combines satellite imagery, maps and the power of Google Search to put the world’s geographic information at your fingertips.” It is an unbelievable resource for canoe trip planning (or reminiscing) as well as a great way to spend a long time online. A large part of Algonquin Park is shown in very good resolution. Altitude, latitude, and longitude are all available anywhere the mouse points, and the tilt feature enables some very interesting views. If you are not familiar with the park, some practice and referencing to the Canoe Routes Map to figure out lake names may be required. If you are not hooked up already, don’t delay joining the Google Earth community. If you already have Google Earth running on your computer, then you’ll want to install the Park Boundary and Access Points overlay KLM File to see it on Google Earth.